you money on monthly gas and electric bills, as well as reduce energy consumption. Shea Roofing can install Techsheidld Radiant Barrier Plywood instead of regular plywood for an average of $300-500 on a home. Beat the heat, cool your hot attic, and save on your energy bills with the solar-powered Green Machine! 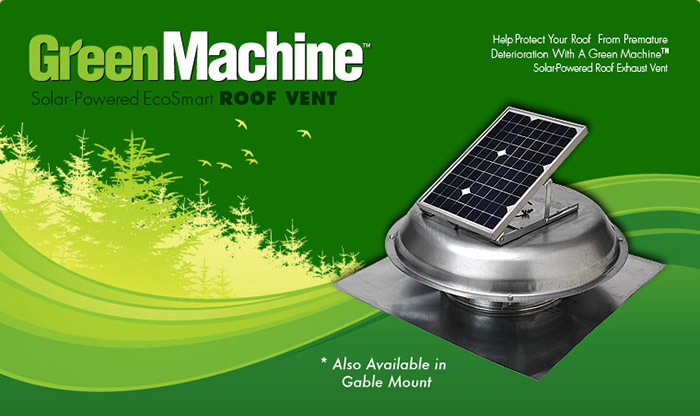 The Green Machine uses solar power to ventilate hot air from your attic before it has a chance to increase your home’s temperature. Make your home more comfortable and energy efficient. If you already have plywood Therma Sheet is a great way to lower attic temps and cut cooling costs. It is installed between the tar paper and shingles to create a Thermal Break blocking the heat transfer into your attic. Therma Sheet lowers Attic temperatures more than 30 degrees!